3B's E-glass is an eco-responsible solution combining outstanding performances with a high energy efficiency and environmentally friendly production. It is also corrosion resistant. Meeting the specifications of E-CR glass standards (ASTM D578 & ISO 2078), 3B E-CR glass is an electrical & corrosion resistant glass that brings longer service life and durability to your composite parts through superior corrosion resistance to acid, water and alkaline environments. Compared with traditional E-glass, 3B E-CR glass leads to higher performance and material costs savings. 3B offers reliable reinforcement solutions with its E-CR glass for a wide range of composite applications and markets. Glass fibre reinforcements allow composite manufacturers to develop lightweight solutions that contribute significantly to reducing CO2 emissions. At 3B, we have integrated pollution prevention at the heart of our manufacturing process to go one step further. By eliminating boron and added fluorides from the composition of its E-CR glass, 3B avoids detrimental manufacturing emissions. As we need a higher melting temperature for our boron-free E-CR glass, we have developed a process of integrated pollution prevention and control, using specific combustion techniques that include oxygen-gas firing and furnace design optimization. Choosing 3B E-CR glass means more value for the customer and less impact on the environment. Removing boron from the glass composition stops the creation of dust particulates. These are associated with the partial volatilization when exposed to high temperatures. The removal of added fluorides from the composition also reduces dust particulates. The implementation of modern melting technology, means a drastic reduction in greenhouse gas emissions reductions such as NOx of around 80%. Increased energy efficiency reduces CO2 emissions. The life of a composite part is becoming increasingly challenging. This calls for the development of composite materials with exceptional and extremely durable properties. Looking for higher temperature resistance, higher corrosion resistance, better static or long term fatigue properties? Look at 3B E-CR glass. Higher stiffness and strength make 3B E-CR glass the material of choice when optimum properties are needed along load bearings. * Representative values of PA compound heat stabilized reinforced with 50% GF chopped strand (10μm; 4mm). Test made with chopped strand coated with the same sizing formulation. Stiffness advantages of typical 3B E-CR glass has been validated in a wide range of thermoplastic resins (PP, PBT, Styrenics, High T polymers, etc.). 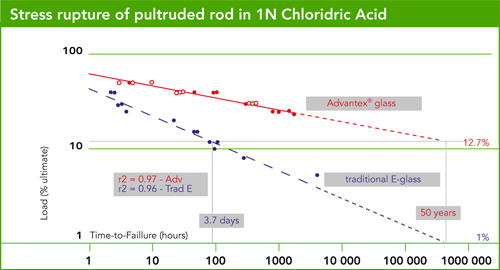 The graph illustrates the stress corrosion resistance of a pultruded rod made with an iso polyester resin and a glass roving content of 75%. The static load was around 1100 MPa. It can be seen that, in a 1N chloridric acid environment at room temperature (23°C), to reach a 50-year service, the stress level should not exceed 12.7% of the static strength. At such stress levels the E-glass rod would only survive 3.7 days. 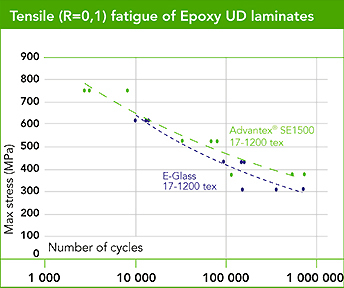 The upper graph illustrates fatigue performance obtained on laminates made with epoxy resin and unidirectional fabrics. It can be seen that typical 3B E-CR Glass fibre improves fatigue performance by half a decade.